Today Samsung India has launched dual-SIM smartphones Samsung Galaxy Y Duos and Samsung Galaxy Y Pro Duos in the Indian Market. 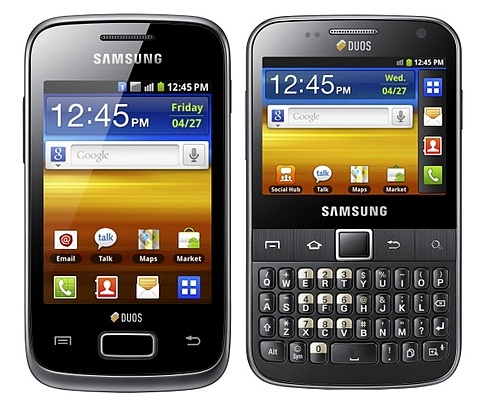 Samsung Galaxy Y Duos is touchscreen dual-SIM smartphone and Galaxy Y Pro Duos is Dual SIM QWERTY phone. Both device has 832 MHz processor and 384 MB of RAM and powered by Android 2.3 Gingerbread. These phones will soon be available in the Indian market.